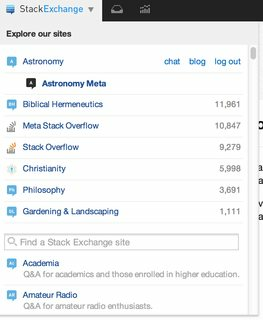 When logged in into stackoverflow and clicking StackExchange button on the bar( top left ), the sites where I'm a member of show before the search bar and every other site which are listed alphabetical. This works for other sites, but not for Astronomy even though I'm a member of it. I first I though the site must not be in beta but space exploration is in beta but still shows at the top. There is a planned change to allow everyone to customize the site switcher, which I'm looking forward to. I kinda don't do much gardening anymore, so that site is one I will probably drop. A few new sites (like Astronomy) are interesting right now, so I'd like to "promote" them. UPDATE: This change has now been completed. Not the answer you're looking for? Browse other questions tagged support status-completed stackexchange . Why can't I click on the up/down vote counter to see how the breakdown looks? Why are no other Stack Exchange sites listed when voting to close a Q as off-topic?